I don’t remember if it was my first or second Thanksgiving as a vegetarian, but mom wanted to be supportive of her teenager, so she bought me a Tofurky. This was before the Tofurky brand had all sorts of fake meats, and even before veggie meats were in just about every grocery store. I suppose it was a bit ahead of its time. It was a “fake turkey kit” that came in a plain cardboard box and cost somewhere around $35 (and that’s circa-1991 dollars!). If memory serves, the package included a quasi-turkey-shaped loaf, some bread crumbs to be stuffed into the cavity of the “bird,” and fake skin that needed to be stretched over the whole thing. I think they’ve improved it since then (and you can now find them much more easily; I think ours might have actually been special order), but I wouldn’t know for sure — that fake skin was scarring enough that I’ll never go back down that road. Every year since, instead of trying to fit in, I just filled my plate with plenty of side dishes. But there was a small part of me that did still feel like I was missing something. After some consideration, I decided that a good solution is to come up with a new tradition. Instead of focusing on what I can’t have, I came up with up with something else I love, and simply chose to make that a part of the holiday. The other night I roasted some fingerling potatoes and tossed a few whole garlic cloves on the baking pan, just for kicks. I was surprised at how giddy I became when I snapped up those little morsels of sticky-sweet-garlicky-goodness. That’s when I realized that roasted garlic absolutely had to become the new Thanksgiving tradition for my family. Nowadays, even though I’ve started eating turkey again (we get ours from Harvest Gathering Farm), I’ve continued the garlic tradition. It really is a wonderful addition to the meal – it’s like an additional condiment. To make it a little more festive, rather than peeling each clove and roasting them separately, we go with the whole-roasted-bulb style. It’s simple and easy. Better yet, considering how much competition there is for oven space during The Big Day, you can prep them early and then just place them directly on the oven rack, fitting them around whatever else is baking. I should probably plan on making breath mints a new Thanksgiving tradition too. Happy Thanksgiving, everyone! 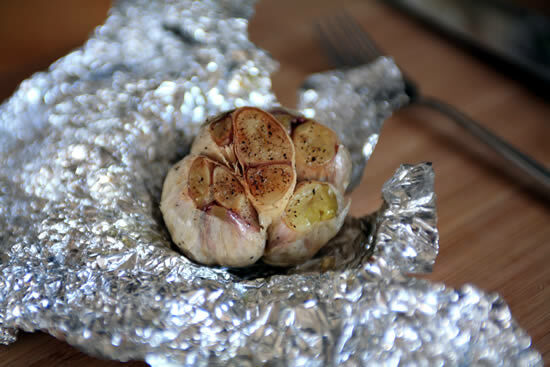 Wrapping the garlic in aluminum foil makes it easy to fit around other items in an already-full oven. 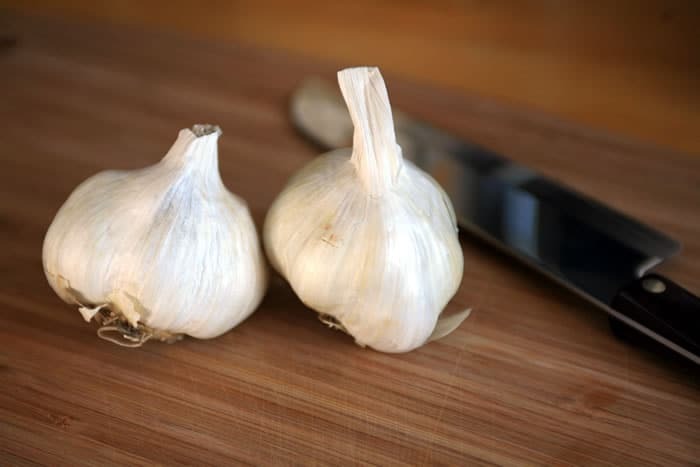 One large head of garlic is enough for 3-4 people, depending on how much they like garlic, of course. 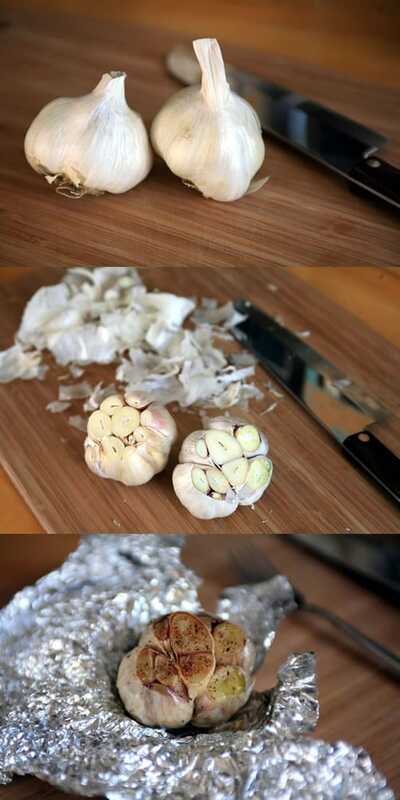 Cut the top of the garlic so as to remove the tip and slice open the top of each cloves. This makes it easier to extract them after they're cooked. If there are smaller cloves on the side, be sure to slice those open as well. Peel away any loose skin, but leave enough to hold the cloves together. Place the head, cut side up, on an ~8" square of aluminum foil. (Or use a clay garlic roaster.) Drizzle the olive oil over it, getting being sure to get plenty of oil into the open cloves. Rub the oil around to coat the garlic evenly. Sprinkle the salt and pepper on top. Fold up the foil and give it a twist at the top to keep it closed. Bake directly on an oven rack or on a baking sheet for 30-40 minutes. Allow to cool for a few minutes, and then carefully scoop/squeeze out the garlic and spread liberally on fresh, whole-grain bread. I’d take roasted garlic over dried-out turkey any day, and I’m not even vegetarian. Might have to incorporate this into my family’s Thanksgiving meal too! Yay! Hope the rest of the fam likes it, too. Happy Thanksgiving! Mmmm sticky goodness. Love roasted garlic. It was one of the first things that was taught to me by my mom when I went to university to “look good for the girls”. Go Mom! Tofurkey = bad time. Sorry I agree with you there. Using garlic to woo women? Impressive is the man who can pull that off. Happy Thanksgiving, Adrian! We use roasted garlic in our holiday mashed potatoes, too! Started the tradition about 4 years ago, and there’s no turning back now. 🙂 Yummy, yum, yum! Happy Thanksgiving! Yummmm, indeed! Happy Thanksgiving, Amber. roasted garlic is definitely at the top of my favorite foods list! delicious! I always put a head of garlic inside turkeys or chickens when I roast them. It adds flavor to the meat and makes a really nice roasted garlic. If you’re not a vegetarian, that is a great way to cook garlic for Thanksgiving.